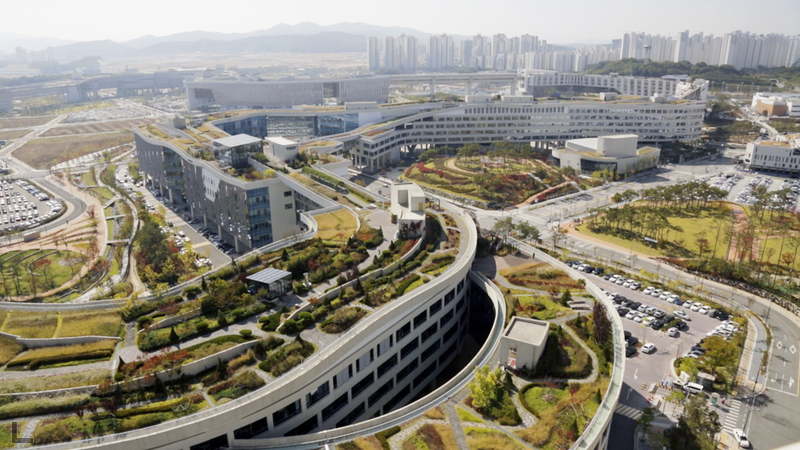 This is a project that took a modest idea, that of green roofs as a public spaces and converted them into the generating idea for shaping a whole city. The four kilometer continuous connecting surface uniting ministries transforms the understanding of public space which here becomes the generator of the architectural form and is completely integrated into the architecture. 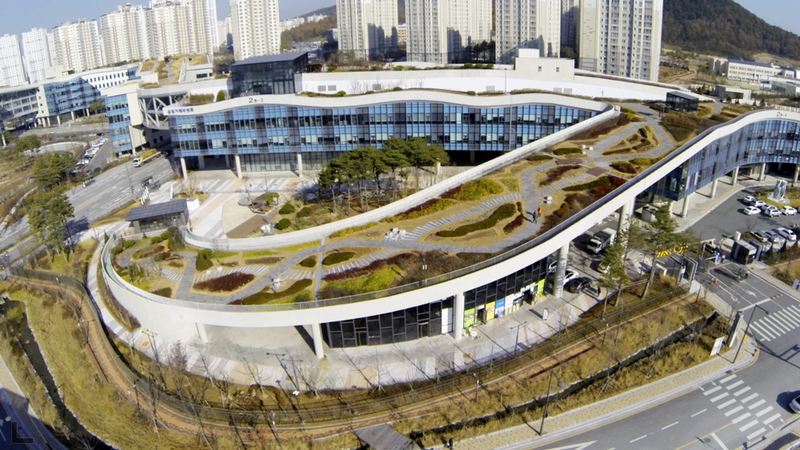 The design of the Master Plan for South Korea’s new administrative city. 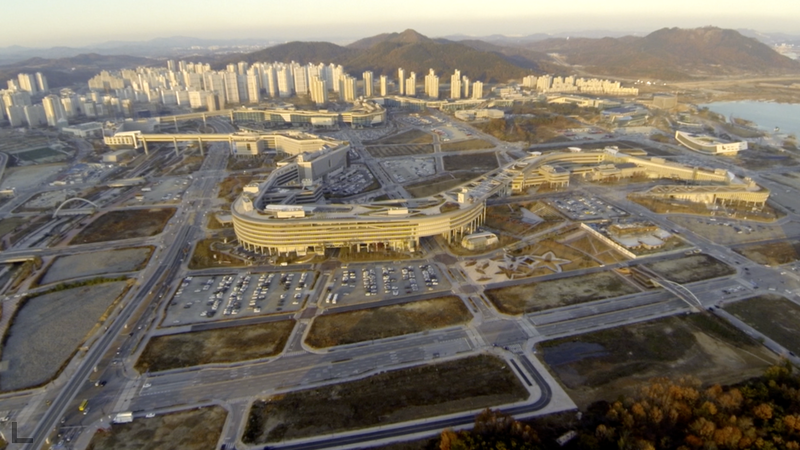 Sejong City, some 90 miles south of Seoul, will be home to 36 ministries currently located in or near Seoul. This project was won in an international competition and is now under construction. FLAT CITY: The iconic plane--the physical and conceptual datum of aligned building rooftops--symbolizes the interconnected unity and democratic nature of the people and the government. LINK CITY: Physical and visual linkages are created between the government and the people, the urban and the natural, the ground and the sky. ZERO WASTE CITY: We created a strategy for the model city development that is based on zero waste principles. All waste from one system becomes the food for another. The third, Zero Waste City was not carried out. Campa de los Ingleses Park designed by Balmori Associates with RTN Architect is the results of an international design competition (2007). 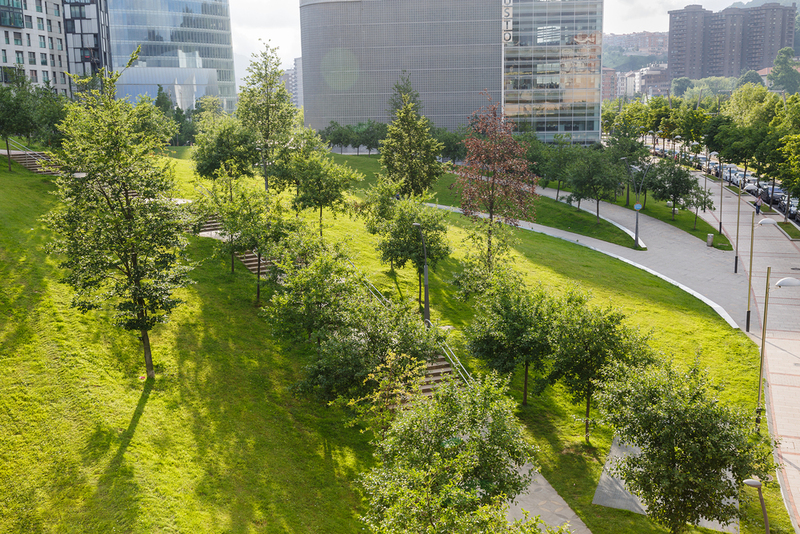 The park flows from the Guggenheim Bilbao Museum, unifying the Abandoibarra area of Bilbao and the Nervión River. 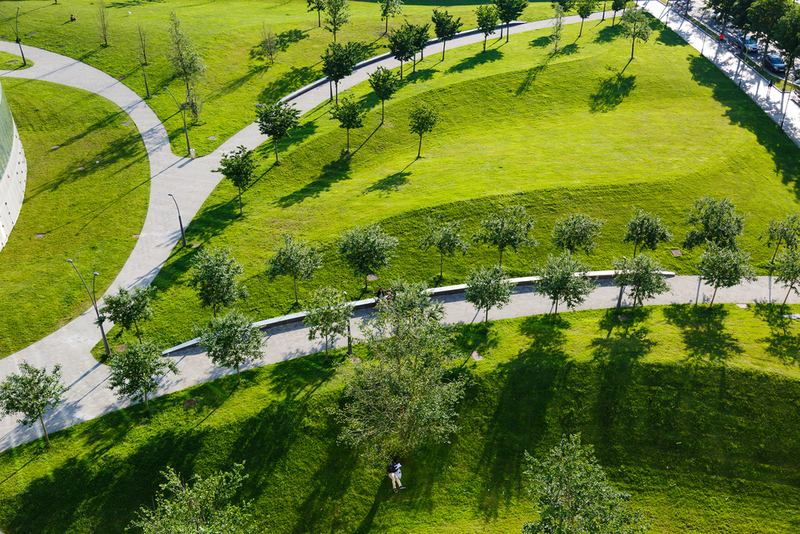 The Park's design was based on gracefully mediating for pedestrians a ten meter (33 feet) elevation difference between the city above and the Nervión River below. This was achieved with ramps, terraces, and topography, earthforms serving to control vistas and to allow for a café to be tucked under. 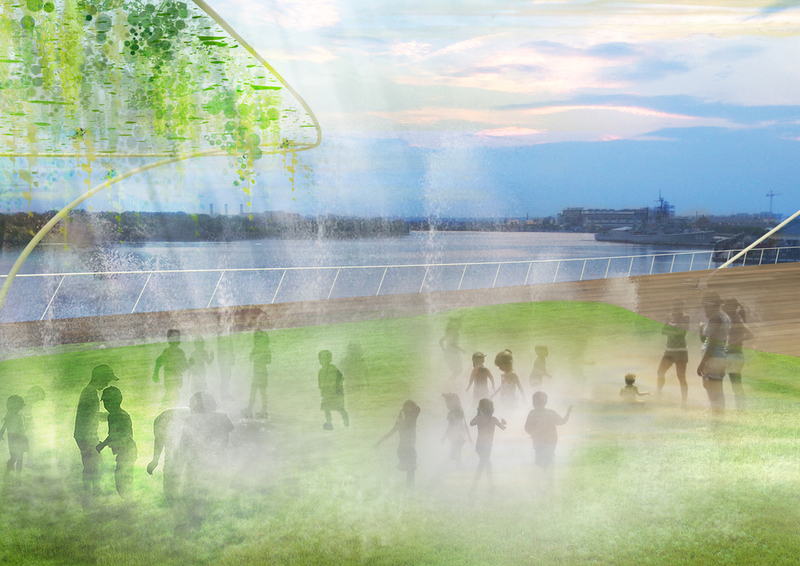 Balmori Associates’ entry for St. Patrick’s Island competition revisits and modernizes the eternal idea of Eden and the foundation of a new era. We propose attracting and supporting wildlife on their terms, not ours. In doing so, we offer a powerful point of comparison with the adjacent Calgary Zoo and create a model for our future relations with other living things. 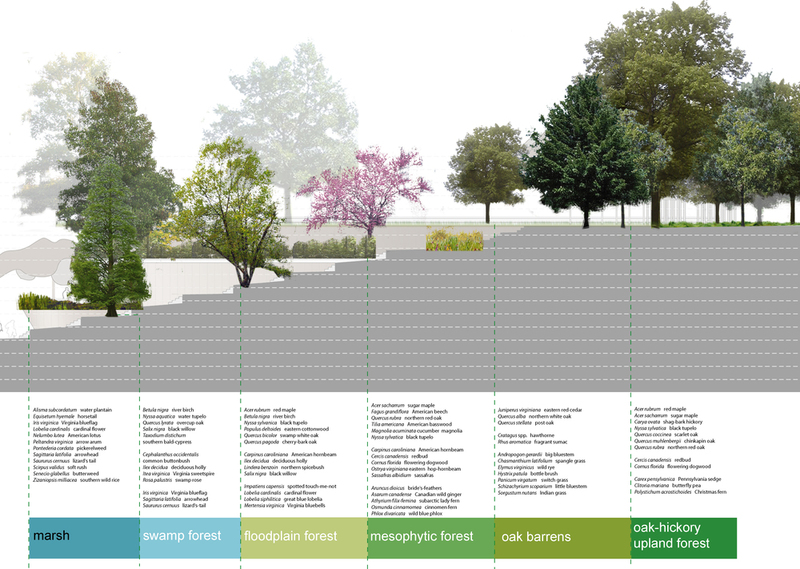 An assemblage of habitats as an ecological mosaic allows local fauna and flora to thrive. 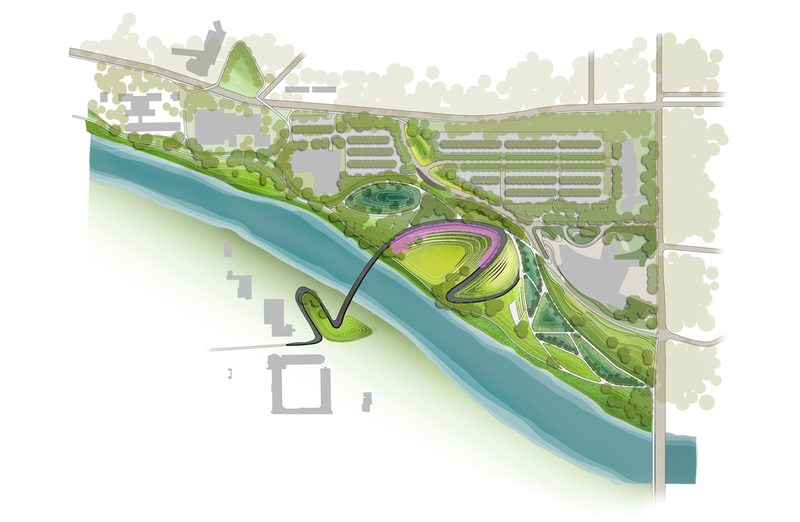 Diversified vegetation cover, enhanced topographical features and integrated water-based ecosystems are relevant to the site’s situation within the Bow River floodplain. Known as “edge effect”, the overlap zones between habitats (ecotones) are privileged as they typically present increased variety of plants. Never realized during the artist Robert Smithson’s lifetime, Floating Island is a 30 x 90-foot barge landscaped with earth, rocks, and native trees and shrubs, towed by a tugboat around the island of Manhattan. The fabricated “island” on view from September 17 to 25, 2005 was visible to millions of residents, commuters, and visitors along the Hudson and East Rivers. Robert Smithson developed the concept for Floating Island in 1970—the same year he created his best-known work, the ambitious earthwork Spiral Jetty at Utah’s Great Salt Lake. Balmori Associates interpreted his 1970 sketch and consulted with his widow the artist Nancy Holt. 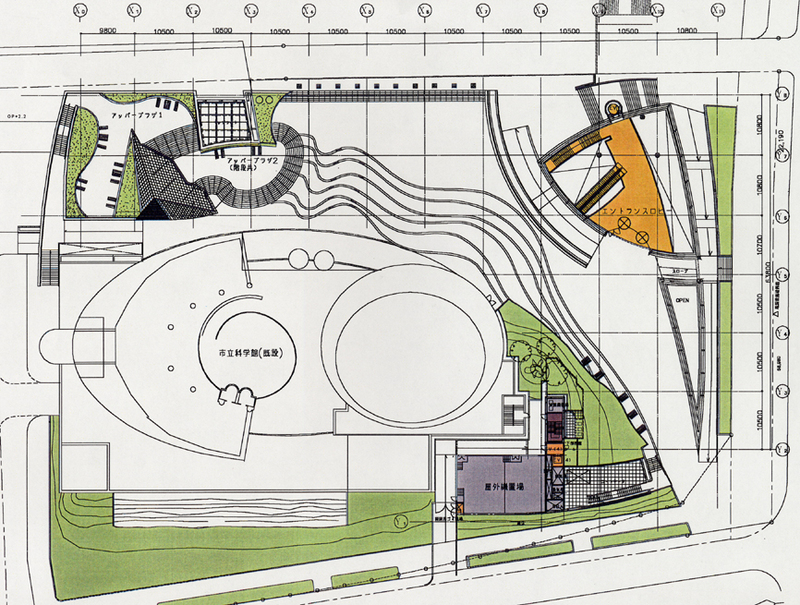 According to her, Smithson's project was intended as an homage to Central Park. Floating Island offers a displacement of the park—itself a man-made creation from its natural habitat. 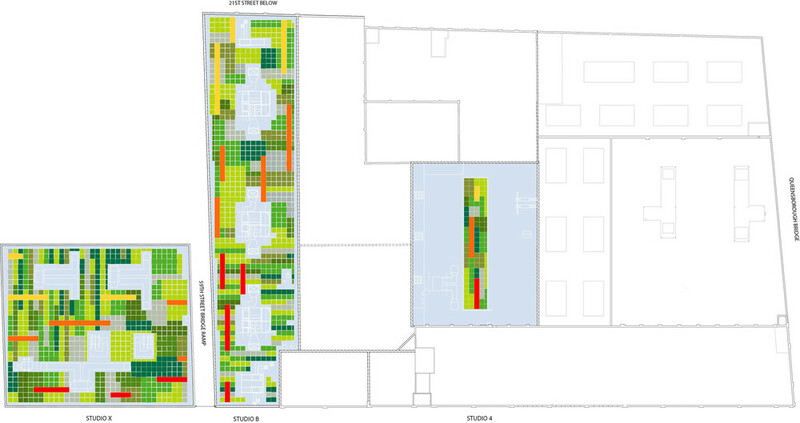 2012 marks the completion of Balmori Associates’ Master Plan for Abandoibarra. For the past twenty years, Bilbao has reinvented itself by regenerating important sections of the city affected by the industrial crisis of the 1980’s. One of those former industrial areas is a derelict harbor in the center of Bilbao called Abandoibarra. The Abandoibarra Master Plan was drawn by Balmori Associates, Cesar Pelli and Eugenio Aguinaga in 1998 (winner of an international competition). 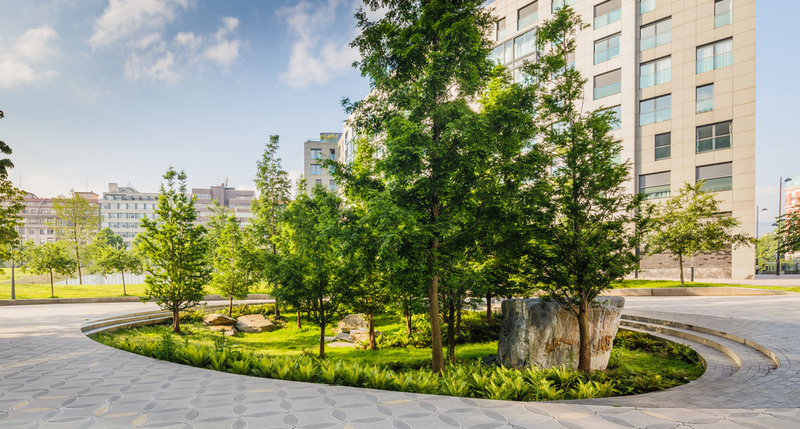 Balmori Associates created park guidelines and designed all open space, streets, sidewalks and plazas, placing emphasis on expanding the amount of green space in the city and incorporating sustainable design practices. Two-thirds of the Master Plan area are dedicated to parks and open space. 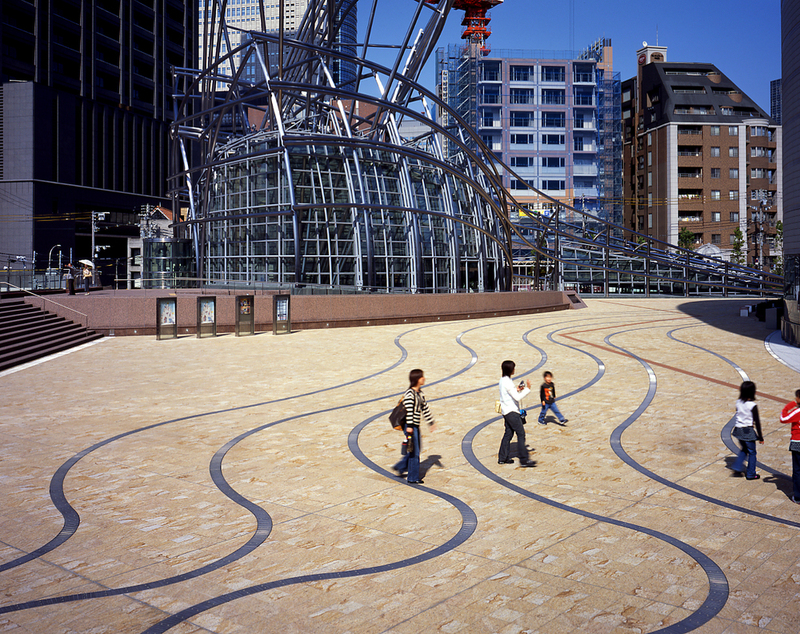 Today, what was once a high-speed roadway, has been turned into a boulevard with multiple pedestrian crossings and a light rail now connects the two main cultural centers of the development: Frank Gehry’s Guggenheim Museum and the city’s opera house. Running on wide swaths of green lawn, this rail line gives continuity to green space. 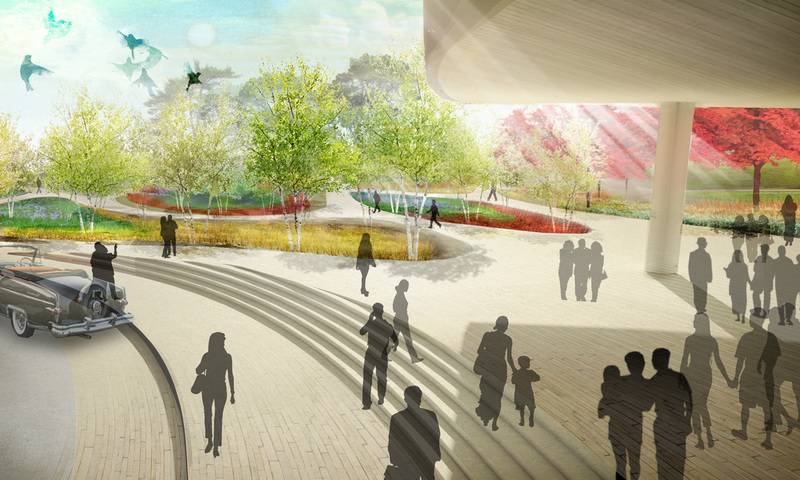 For the river edge, Balmori proposed a linear park, Parque de la Ribera. 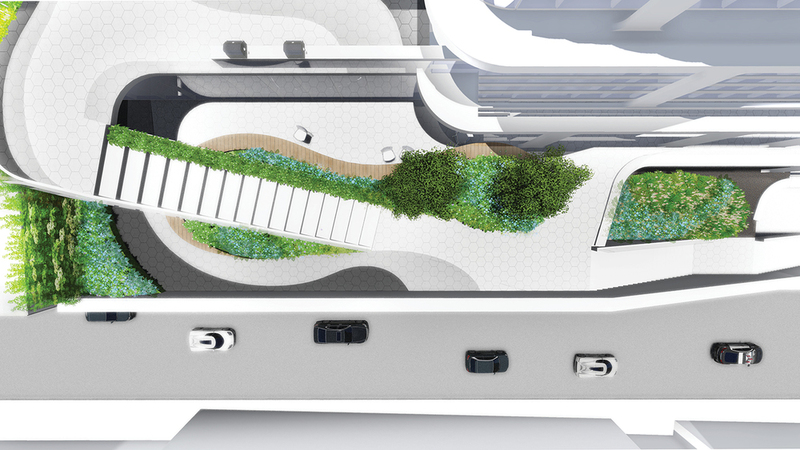 This new promenade, no less than thirty meters in width, is treated as a longitudinal space at two levels. 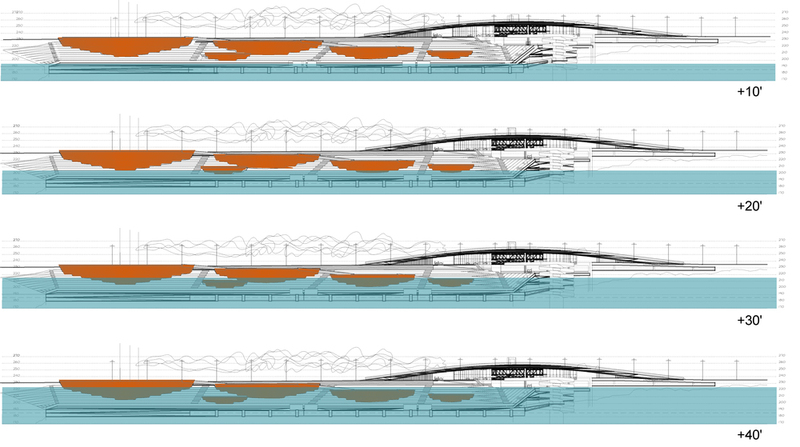 The half nearest to the water proposes the pier’s rehabilitation, maintaining the existing dialogue between both shores. The inside half, which is located at the 6m level, concurs with the exterior of the Guggenheim Museum. In 2005 this section of the Master Plan received the Special Award ‘Città d’Acqua’ of the Biennale di Venezia for Best Project. 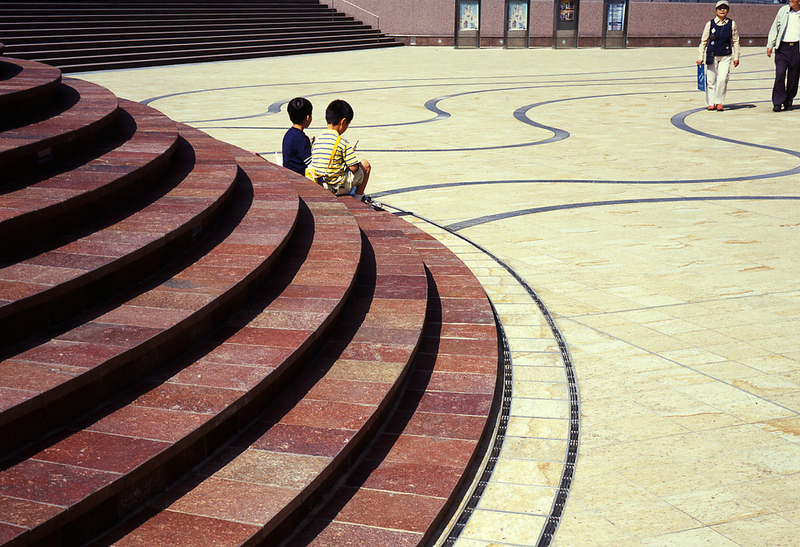 In 2003, Balmori Associates was commissioned the designed of Plaza Euskadi and in 2007, together with RTN Architect, won an international competition to design Campa de los Ingleses Park also located in Abandoibarra. An experiment to clean water through phytoremediation, desalination and rainwater collection to irrigate productive floating gardens. Balmori Associates has designed, fabricated and is launching a floating landscape in Brooklyn’s Gowanus Canal, one of the most polluted bodies of water in the United States. 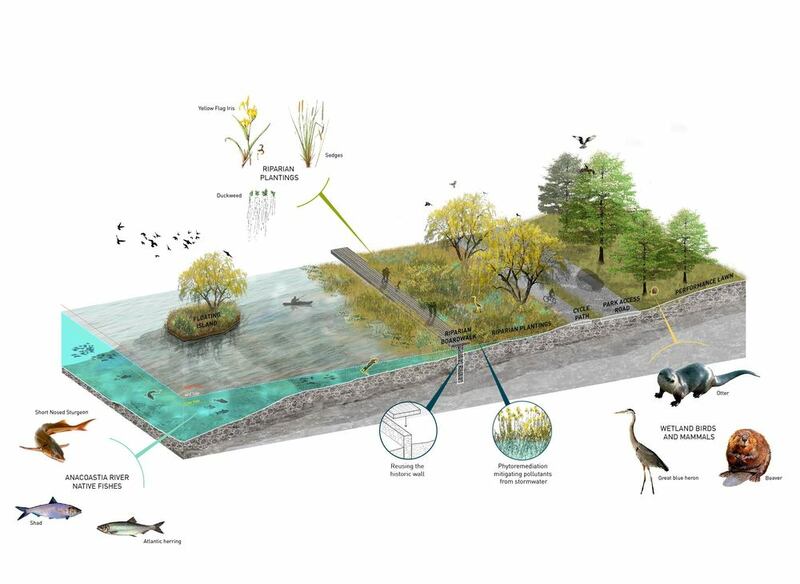 The floating infrastructure is one in a series of projects Balmori has designed to act as sponges that filter and clean water and provide wildlife habitats in the city. 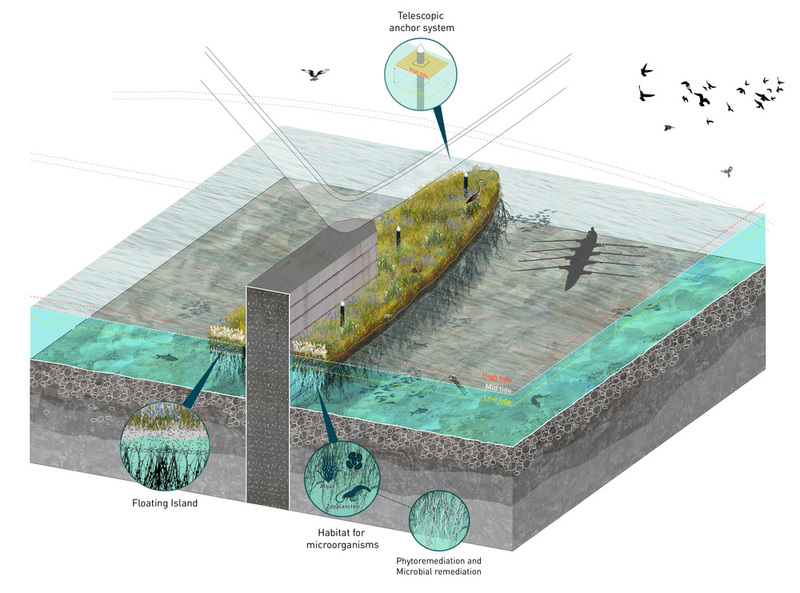 Floating infrastructures can adapt to and address rising seas. GrowOnUs, an experiment in floating infrastructure was launched on Friday September 18 at 11am at the Third Street Bridge in Brooklyn, NY. The project was funded through a $20,000 grant Balmori Associates and the Gowanus Canal Conservancy received from the Cornelia & Michael Bessie Foundation to research and create a floating productive garden in the Gowanus Canal. Once a hub for maritime and commercial activity, the Gowanus Canal has captured industrial waste products from factories located along its banks; and during heavy storms, combined sewer overflows (CSOs) bring not only stormwater to the canal but also untreated human and industrial waste, toxic materials, and debris. GrowOnUs will be monitored to study the viability of producing large scale edible floating landscapes in cities with polluted rivers. 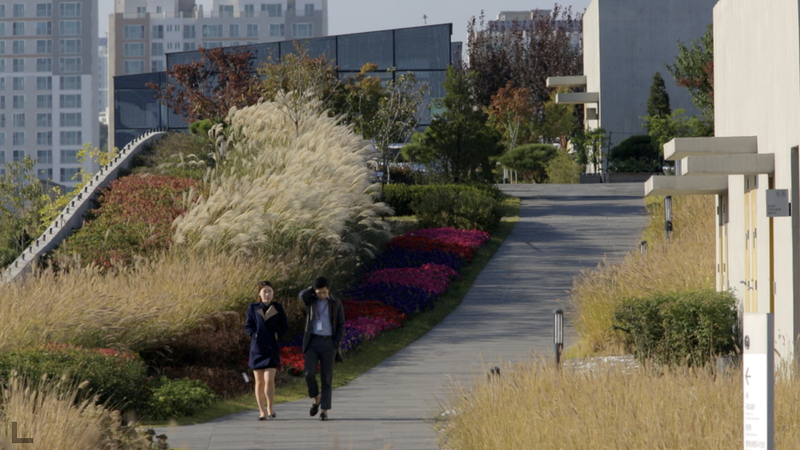 It will also further explore other functions with urban potential as a multi-functional green infrastructure: shoreline protection, biodiverse habitats, energy production, and public space. 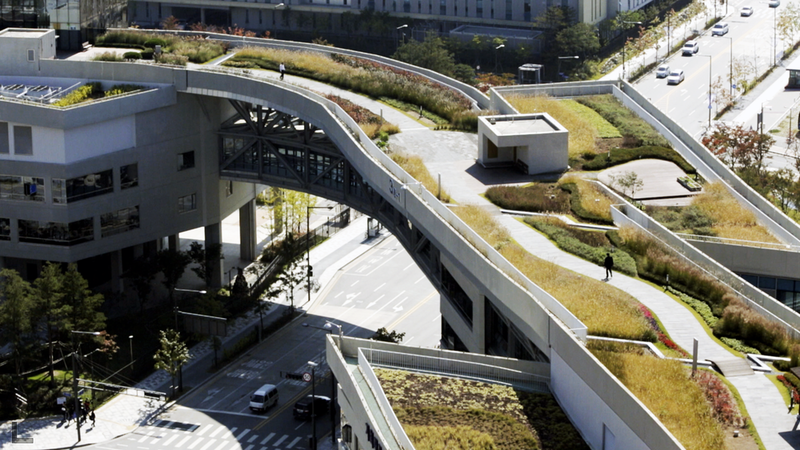 Similar to green roofs or linear parks in place of traffic medians, floating landscapes exist on the edges and underutilized spaces within cities. 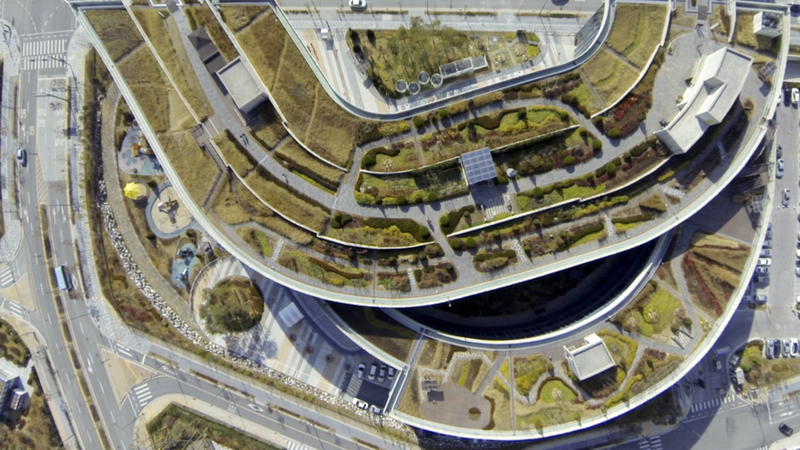 Whereas green roofs exist as an intersection between landscape and architecture, floating islands are a model of the interface and transitions between the river, the landscape and the city. 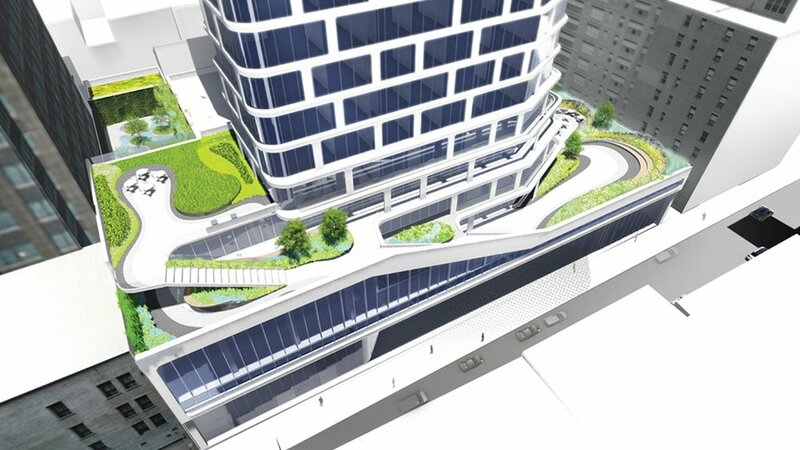 The Grand Connection will provide a sweeping new vision for Bellevue. 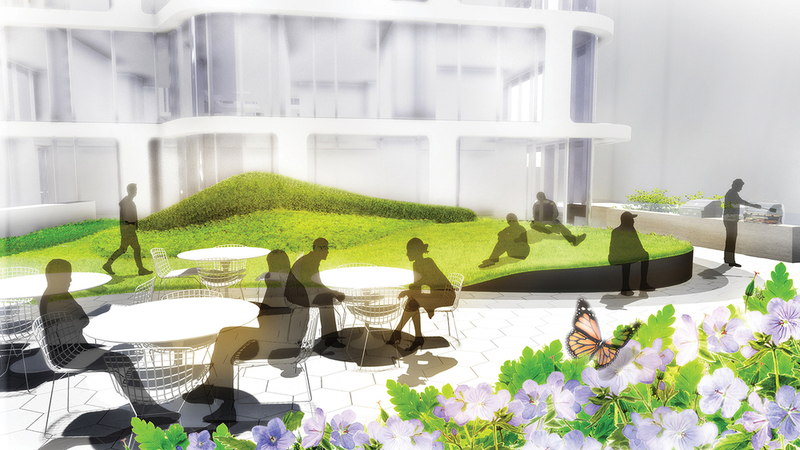 Envisioned as a signature urban experience and means of connectivity, the Grand Connection will become an identifiable element of Bellevue’s urban landscape. Improved connectivity, urban amenities, and experiences will enhance Bellevue’s existing infrastructure within Downtown, while a signature and dynamic crossing over Interstate I-405 will usher in a new era and vision for Bellevue’s Wilburton Commercial Area. As a long-term project, the Grand Connection will also incorporate smaller placemaking improvements that will “claim the corridor” and begin to establish the overall vision. 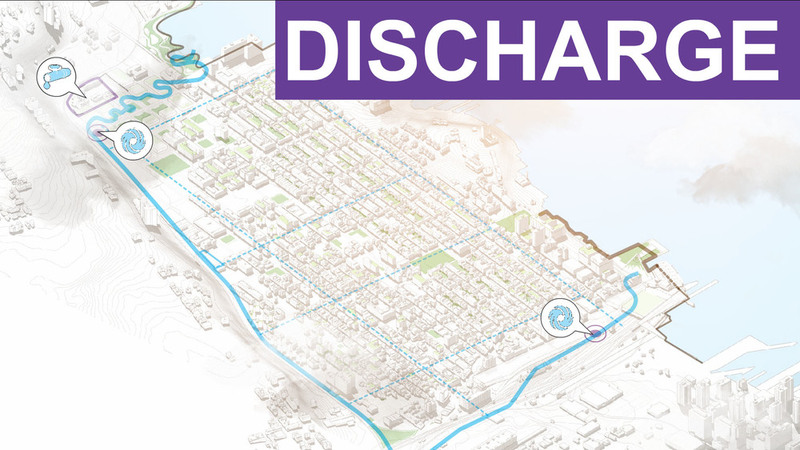 In addition to improving aesthetics and placemaking, the Grand Connection will improve overall connectivity and safety for non-motorized transportation. Building upon the framework of the Pedestrian Corridor plan, the Grand Connection will sculpt and frame a new pedestrian and cyclist environment that embraces the urbanity of Downtown Bellevue. While the visioning process assisted in establishing an exciting and transformational vision, it also sought to remain pragmatic, understanding the constraints of many places along the route. 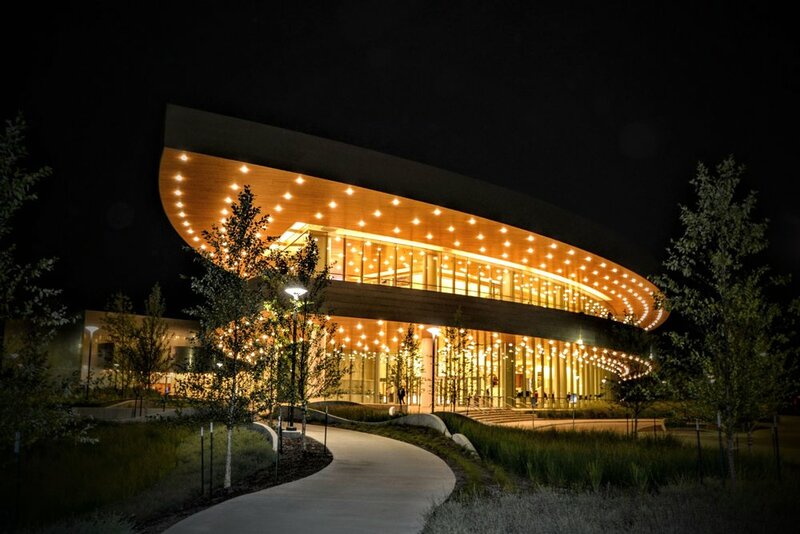 The visioning process was tasked with developing solutions for both the near and the long-term, creating goals and opportunities as Bellevue grows, while capitalizing on early wins and implementable strategies that are budget and time conscious. 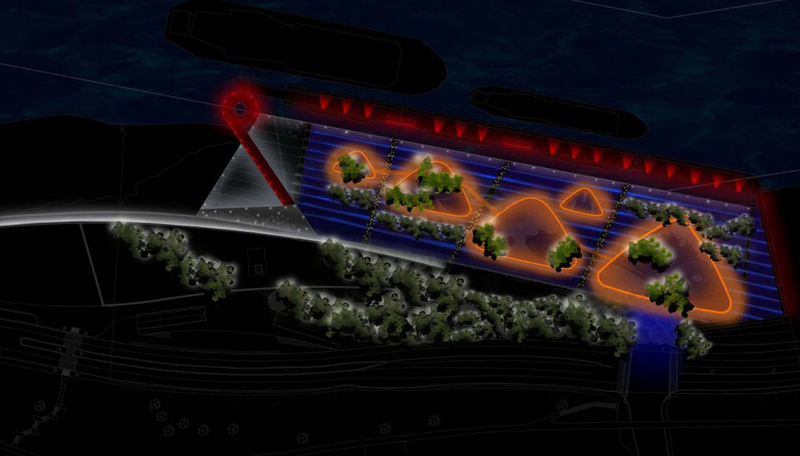 As a member of the jury for the second edition of an International Competition of urban gardens in the city of Bilbao called “Bilbao Jardín 2009”, Diana Balmori was invited to create a temporary garden. Balmori, like each of the twenty-five selected participants, was assigned a ten meter by ten meter square in which to design a garden. The site was located at the landing of a large staircase between two Arata Isozaki towers leading to Santiago Calatrava’s footbridge over the Nervión River. Instead of remaining at the landing of the stairs Balmori stretched the same hundred square meter surface into a narrow band and shifted the site in order for the garden to climb the stairs. In one broad stroke the garden performed a narrative of landscape which transformed the way this public corridor was perceived by users. In form, the garden engages the horizontal plaza with the rising vertical plane of the steps and the upright gesture of Eduardo Chillida’s sculpture. Like the famous ‘Spanish Steps’ in Rome, the garden is not only designed for visitors to ascend and descend, but for them to linger. “The Garden That Climbs the Stairs” transformed a space in an unexpected way. It transformed the stairs and the space around them. 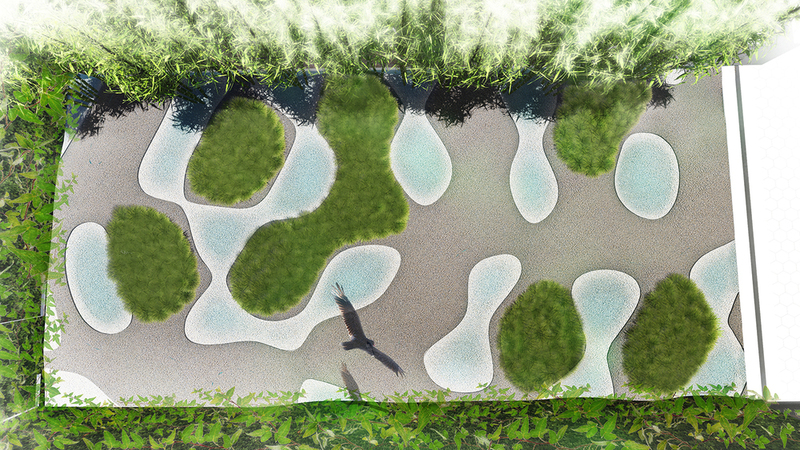 The landscape design for the project is driven by the character of the Mata Atlantica Forest found on the site. Only 9% of this Brazilian ecosystem remains in the world and a few disconnected patches of this forest exists in São Paulo. 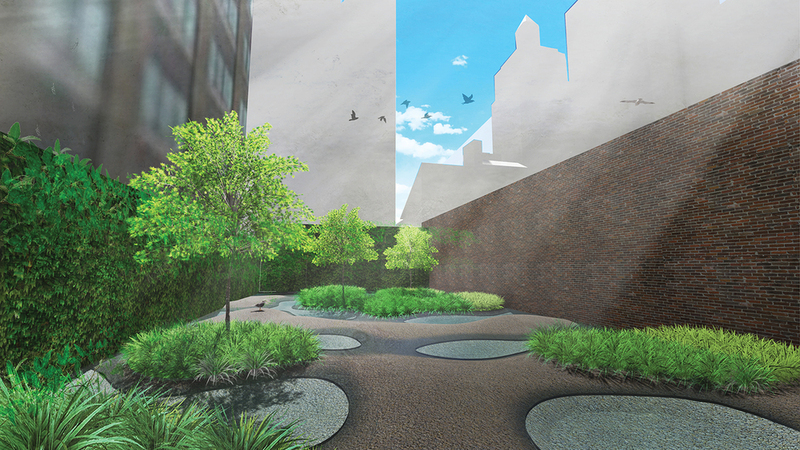 Our project celebrates its biodiversity and spatial richness in the urban landscape of São Paulo. São Paulo Corporate Towers’ landscape follows the spatial rhythm, heights and patterns of the forest as it weaves across the site and through the two towers of the architectural program. Tree canopies of various heights create magical outdoor spaces of dappled sunlight and shade, providing a cooler environment. Landforms accentuate the display of the vegetation in their multiple canopy layers. 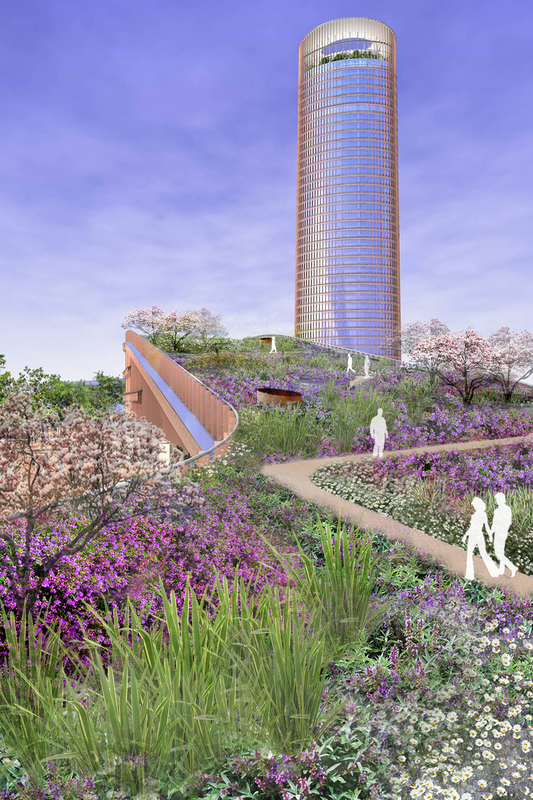 A large green roof accessible by a series of ramps becomes a link between the two towers and integrates the amenity building. An elevated metal path weaving through the site and becoming a public sidewalk on the street offers a unique experience of walking in the canopies of trees. The collection of rain water on site and the selection of native species with lower water demand, allows for minimum irrigation. Plaza Euskadi connects the nineteenth century section of the city called “El Ensanche” to the new section of Bilbao, Deusto university campus, the Guggenheim Museum, and the Nervión River. 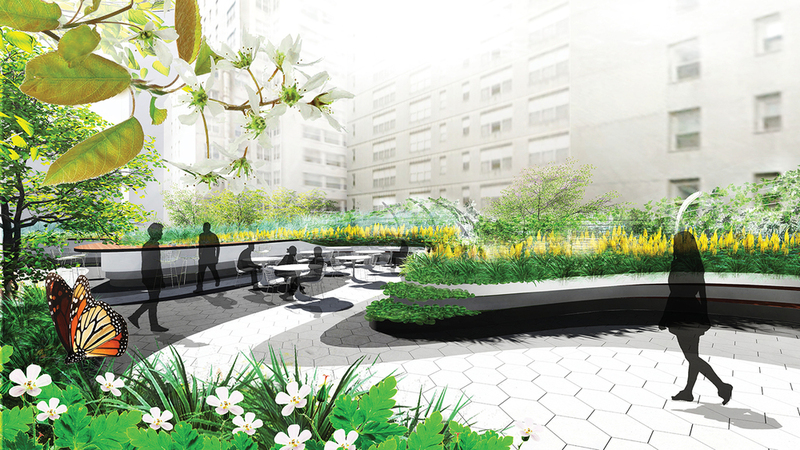 The Plaza is a pivot, unifying diverse elements of the city. Apart from the Museum of Fine Arts and historic residential buildings, the plaza is surrounded by contemporary buildings such as university and library buildings, a shopping mall, a subway station, hotels, residential buildings, an office skyscraper, designed by different architects including Gehry, Moneo, Pelli, Siza, Krier, Legorreta, and Stern. Oval in form, the plaza has two forms of circulation: a tree-lined perimeter path for leisurely walks and sitting, and a dominant central path which brings the people from downtown to Abandoibarra to the Campa de los Ingleses Park, The Rivers, and the pedestrian bridge crossing the river to Deusto University and its neighborhoods. 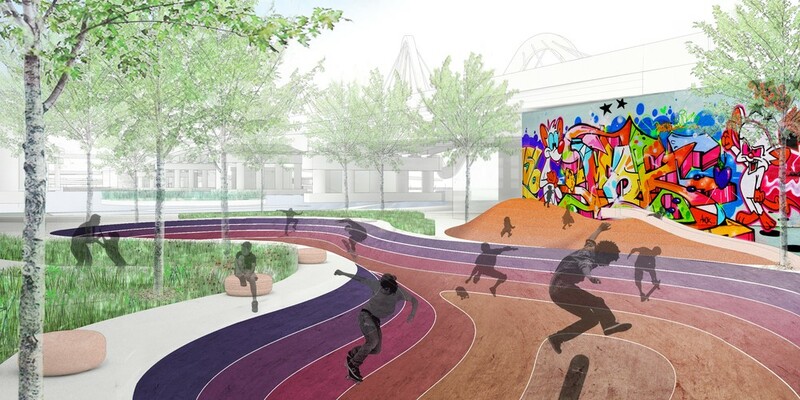 Three public park “pockets” hook onto the sides of the central path, which provide colorful and playful seating made from recycled rubber. Each pocket has a different character: an amphitheater section with reflection puddles, an ottoman seating section, and a “garden” section of flowering shrubs with a 100 year old Laegostremia tree. In 2008 the construction of the plaza was impacted by the economic downturn in Spain leading to a complete re-design. The final design cost was half of the original construction budget which required the removal of fountains, a more modest planting and grading scheme, and a shift in materials. 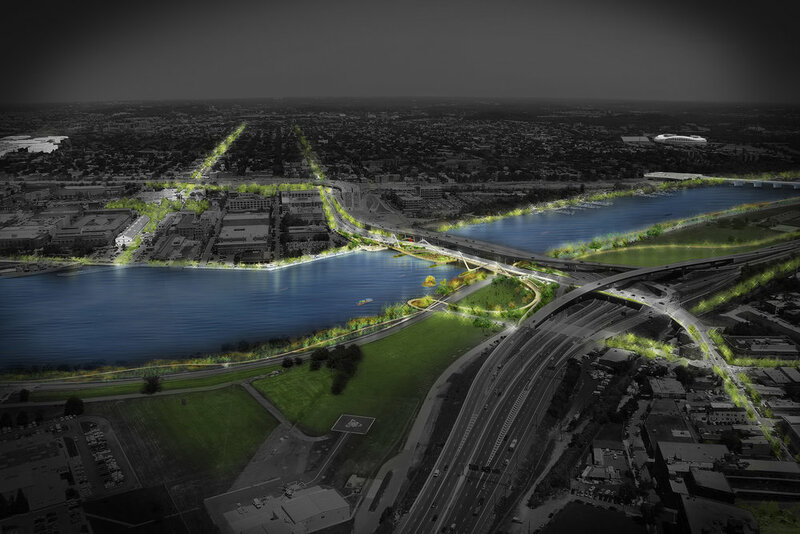 The 11th Street Bridge Park competition was a design effort to integrate the forces of gentrification that its development would unleash into an overall design approach ruled by protective policies. The 11th Street Bridge Park design encourages the economic development of local enterprises, introduces cultural elements that the Anacostia and D.C. communities are lacking, and incorporates aspects of local history, kicking off a new era of urban development through policies that protect the local population from gentrification while strengthening the community. The integration of economic, social and cultural policies would make this a resilient urban planning. 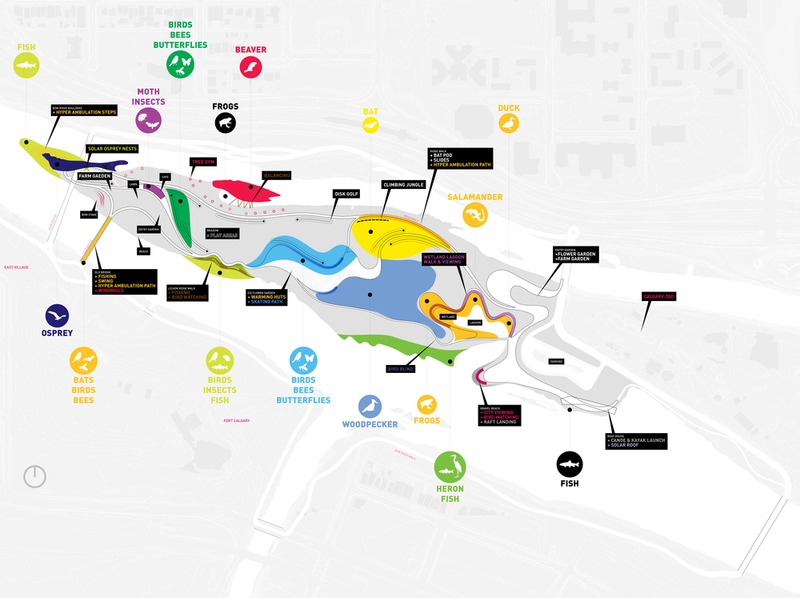 The design approach and the community programs proposed for the bridge park reinforced one another through the creation of hybrid programmatic spaces. 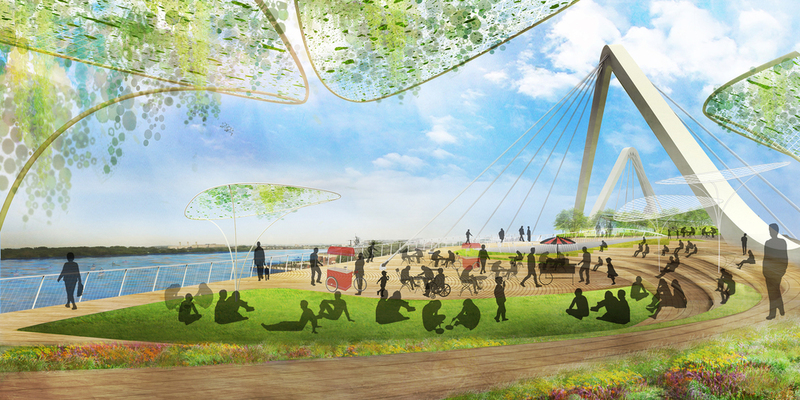 The design of the bridge creates a space for diverse communities to come together on this neglected Anacostia. It provides a vehicle for very separate communities to communicate. 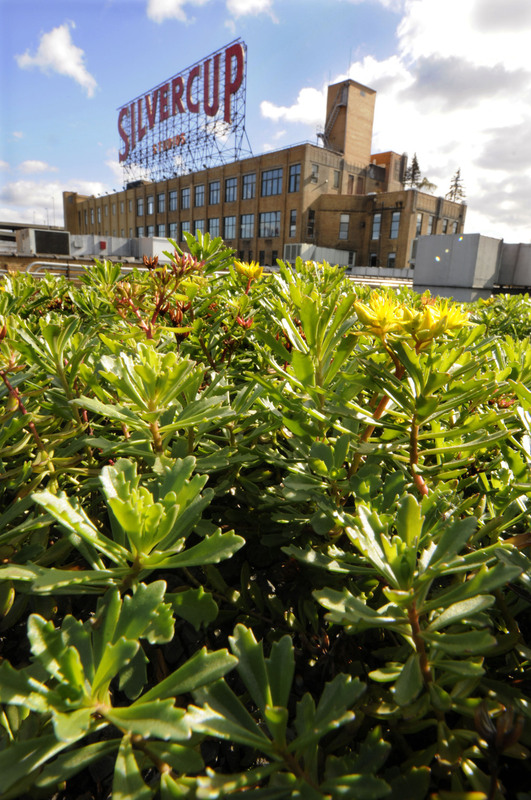 Benefits monitored on its green roof: absorption of air pollutants and carbon dioxide; improved outdoor air quality; increased energy efficiency and storm water run-off reduction (a particular burden to the sewer infrastructure of Long Island City). EarthPledge, a non-profit organization promoting technologies for sustainability, installed the Silvercup roof research station. 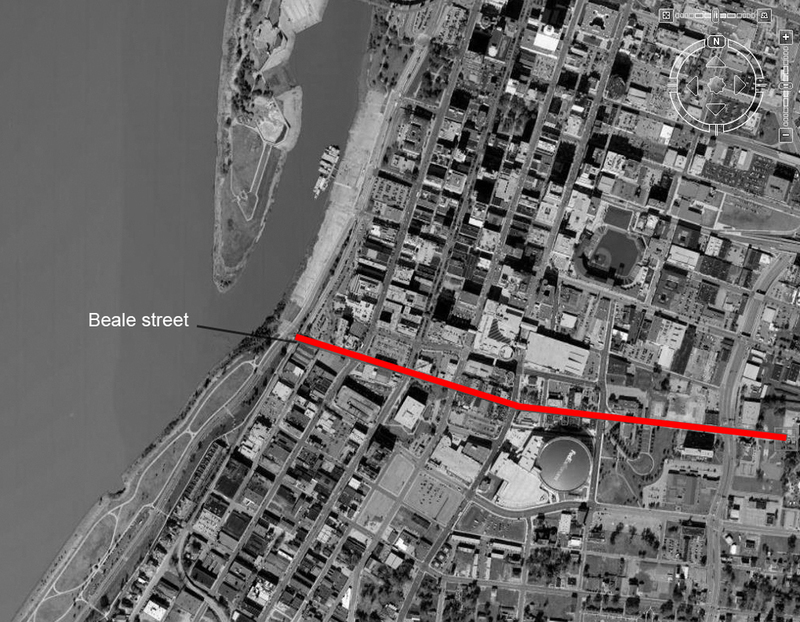 A twenty-five-foot bluff rises from a once busy commercial harbor in Memphis' old downtown, which, like many American waterfront cities, historically turned its back on the river that was once its lifeblood. Balmori Associate’s design consists of a series of level, landscaped islands formed in the terraced slope of the river’s edge, highlighting the tidal changes at the river’s edge, which can exceed forty feet. 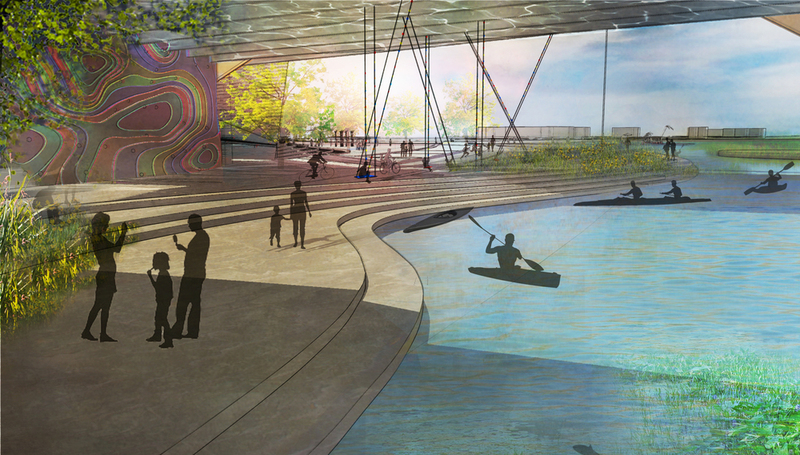 The intent of the design was for public space to interact with the changing levels of the river. The islands are each planted with a distinct native plant community of Western Tennessee, strategically corresponding to the fluctuating levels of water inundation. Water collected on site is filtered and cleaned through vegetated terraces and then stored in a cistern for reuse in irrigation. 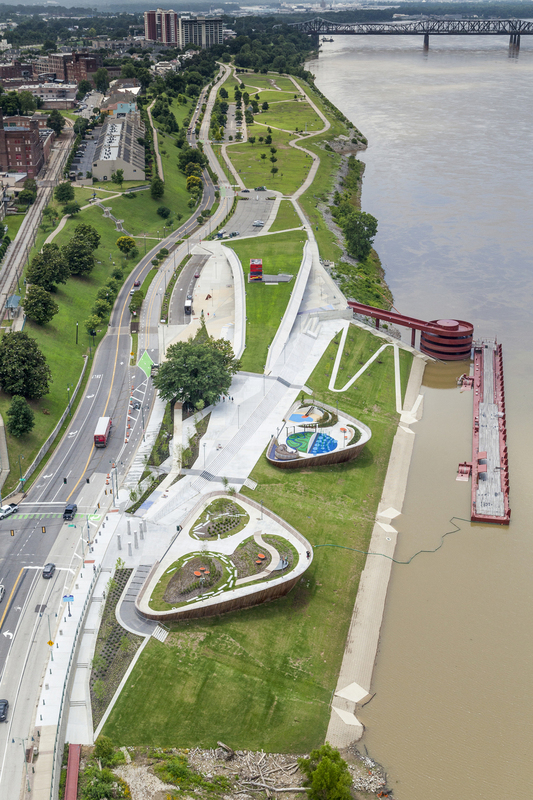 Each island creates a unique public space, including a river overlook, a children’s play area, a performance space and wetland gardens, choreographed with the changes in The Mississippi River. 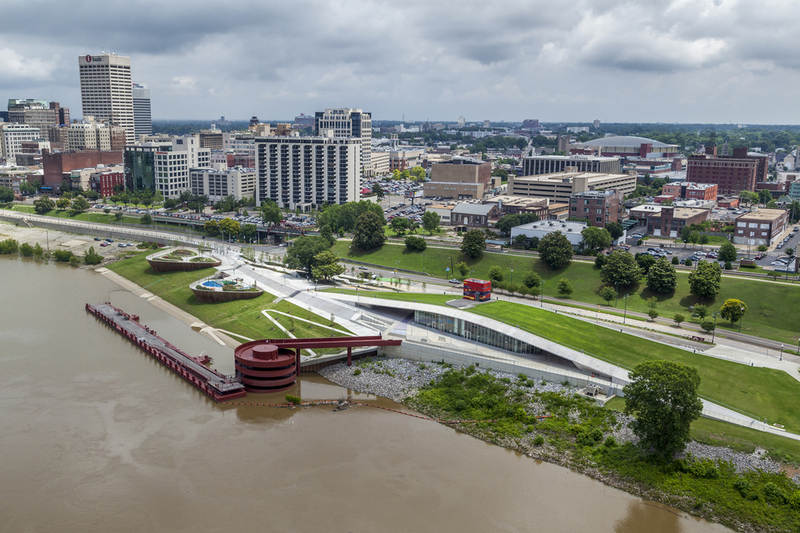 The five-acre riverfront park is the departure and arrival point for thousands of river travelers and will provide a destination point for individuals and groups to celebrate the spot where the world’s most powerful river engages the home of the blues. 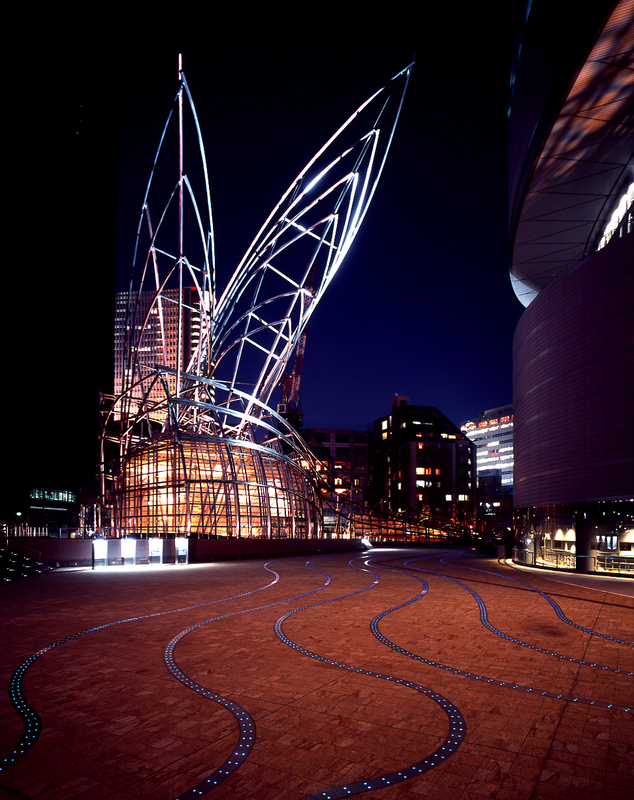 A new contemporary art museum in Osaka, Japan was constructed completely underground, adjacent to an existing science museum. The plaza above the museum ends on a pyramidal mountain form meant to invoke a mountain. This black granite pyramid is covered with a thin sheet of cascading water. Curvilinear stairs lead down to the ‘plain,’ where the stainless steel ribbons flow across the main plaza, leading toward the stainless steel sculpture that marks the new museum’s entrance. A large liquid arc at handrail height starts at the museum’s entrance sculpture. The water flows over small black river stones along the side of the staircase descending into the museum, ending in a cascade.